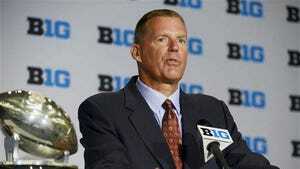 When Randy Edsall steps to the podium Friday, the first three meaningful words out of his mouth must be, "I am sorry." Randy Edsall is returning for his second stint as UConn's head football coach. When he left UConn the first time, he was criticized for not talking to his players before he left. Edsall will have an introductory news conference on Friday at UConn. Columnist Jeff Jacobs believes Edsall's first words Friday should be "I am sorry." UConn football fans deserve to hear those three words. The former UConn players who were in that locker room in Arizona following the 2010 season's Fiesta Bowl loss deserve to hear them. So, too, do the players Edsall is inheriting. In the press release announcing that the once UConn football coach will once again be the UConn football coach, the Susquehannock High School graduate got a head start on addressing the ugly, pus-filled wound of his departure. "Certainly as I look back on it, I wish I had done things differently in that instance," Edsall said Wednesday. "I completely understand and respect that there are loyal fans, supporters and former players that still have not forgotten and it will take time to forgive." The words are careful and carefully crafted. They are a start, but only a start. Edsall needs to look into the cameras at his re-introductory press conference at Rentschler Field and say, "I am sorry." Say it. Mean it. Own it. He needs to be the man he asked his players to be over more than a decade at UConn. He needs to apologize for bolting his team in the middle of the desert night. Admit he screwed up. Stand up. Take accountability in front of Connecticut. Edsall went overboard in selling Maryland as his dream job. Maryland wasn't Penn State. Maryland wasn't Notre Dame. More than once in the month leading to the Fiesta Bowl against Oklahoma, Edsall had wondered aloud how many more notches in his belt he could amass at UConn. There were more notches, like a sole Big East title, notches like more than one victory in 17 games against Top 25 teams. Yet taking his shot at Maryland after a dozen years at Storrs? Few can begrudge him for what he saw as his big career move. The way he handled himself in the hours after the Fiesta Bowl, however, is the wound that will not fully heal until Edsall heals it. He was the one who opened it. He is the only one who can close it. The way so many of the players found out their coach was gone through e-mail, voice mail and text message was distasteful. The way he had Jordan Todman address the team in the locker room after the loss to Oklahoma to say he was leaving early for the NFL, yet did not have the gumption to do the same thing himself was distasteful. The way he headed to Maryland and didn't even return with his team to Connecticut was distasteful. The way the 25 on the chartered flight back home — the rest had scattered around the country for semester break — were held on board upon landing for a half hour for Edsall to come on speakerphone was distasteful. When Edsall said in the press release how it will take time to forgive, well, that rings a little hollow. Those who wanted to forgive him forgave him a long time ago. Those who don't want to forgive him probably never will. UConn fans may forever be divided on that point, but to fail to address it head-on from the start leaves the pus from that night oozing. Randy Edsall needs a level of forgiveness, but more importantly he absolutely needs closure. A man, especially a head college football coach, makes his own choices in life. And now Edsall has the choice of a heartfelt apology to UConn fans and those former players to make them believe he regretted what he did that night, so everyone can move on. And, importantly, so that the players he is inheriting can believe in him. In covering sports for 40 years, I have learned there are too things athletes want: playing time and loyalty. Edsall needs that loyalty from the start with his team. Reasons to believe in Edsall: For there is still plenty to believe in with Randy Edsall. He was hired before the 1999 season to build a major college football program and he was a success in that mission. Was he extended ample time, money and patience by former athletic director Lew Perkins to get that job done? Absolutely. The early results were not pretty, but by the time UConn got into the Big East he had molded a program capable of competing and winning in one of the six former BCS conferences. He remains one of the most organized and systematic coaches I've met. His attention to detail, his demand that others pay attention to detail is impressive. Forget football for a moment. He could be hired for anything from running an insurance company to making widgets and that company would be A-1 efficient and extremely well-run. His UConn teams almost never beat themselves. They win the games they are supposed to win. That is not meant to damn Edsall with faint praise. That is big praise. Too many coaches in sports find ways to lose. His staff also demonstrated a knack for recruiting two- and three-star recruits and coaching them up to major college players over four or five years. Some recruiting people have told me part of it was Edsall being secretive about the guys he landed and that they actually were better at the start than advertised. Whether he coached the heck out of them or found ways to land legitimate unheralded talent — or both — he won at a New England school where some people have argued you can't win. Yes, Edsall, could grow suspicious and controlling at times. He never fully recovered from his introductory press conference at Maryland when he played the new-sheriff-in-town card too mightily. Sally Jenkins of The Washington Post famously compared him to Captain Queeg a year into his Maryland job. Yeah, he could get a little paranoid. He isn't alone on that count among football coaches. Shined during program's darkest hours: Yet in the program's darkest hours, after the murder of player Jasper Howard in October 2009, Edsall handled himself the way every parent would want their son's coach to conduct himself. He demonstrated greatness. Here, too, is one major difference between Edsall and Diaco: Except for former athletic director Jeff Hathaway, who Edsall clashed with about stricter admission guidelines, the folks at UConn outside the tight coaching circles liked Edsall. That counts for something. To give praise to Diaco, he did leave Edsall with a more disciplined program than the one he inherited. Does Edsall need to do a better job connecting with Connecticut high school coaches this time? Yes. He missed out on some state players. Offensive coordinator will be key: Could Edsall's game plan be vanilla? Absolutely. Yet this also is 2016 and not 2006, one would suspect his game plan has evolved some with the college game. His choice of an offensive coordinator will be paramount. On this point, he will need to assuage his critics and those fans so jaded by the Diacolypse. The questions about offense are only starting. Yet at the very least, the execution will be better than what UConn fans saw in the past three years. Good grief, considering UConn was last in the nation in scoring, it can't get worse. The events of the past few days have left people nationally wondering what the hell is going on at UConn. Why wait a month after the end of the season to fire Diaco only to rehire Edsall, who surely wasn't going anywhere else fast, within 48 hours? Diaco's buyout being $1.6 million less on Jan. 1, 2017 than on Dec. 31, 2016, obviously is part of the equation. The quick jump to Edsall, without a real search, with a small list of candidates, will remain unexplained fully until athletic director David Benedict speaks Friday. Support from former players: Former UConn players undoubtedly have had some role. Edsall counts many supporters among them. That's fine. Recommendations from former players alone also cannot be the only reason for such a vital decision. Benedict has much invested in this move. After Paul Pasqualoni, any notion of a "safe" hire sends chills down the backs of UConn fans. Sometimes the safest choices become the most costly. Edsall isn't necessarily safe. He is proven. Coaches returning to a team, pro or college, the second time also often fail to reach the success they had the first time. Edsall is 58. He still has the health and energy to build a program a second time. He must use every ounce of that vigor. First, he must write the final sentence on his first tenure as UConn football coach. It will only take three words. Then, love the hire or not, Connecticut can move on.